Great start, rough ending and insanely proud of my girls. #whatditch? — with Chloe – “Jersey Girl” and Jen Garber. Novice level at Larkin Horse Trials in Nassau, NY First after dressage, then a clear stadium round which still left her first after stadium… and then some confusion on the cross country which left Jen unsure (and rightfully so). On approaching jump 4, the fence had a “4b” but no “4a”. She thought she missed “4a’ and lost her momentum going to “4b” (looking back for the “4a” jump). By the time she saw the “4b” jump, a ditch, it was too late. Chloe stopped and Jen flew into the ditch. Frank’s photo capture of this is quite funny and cute, especially since Jen and Chloe were not hurt. 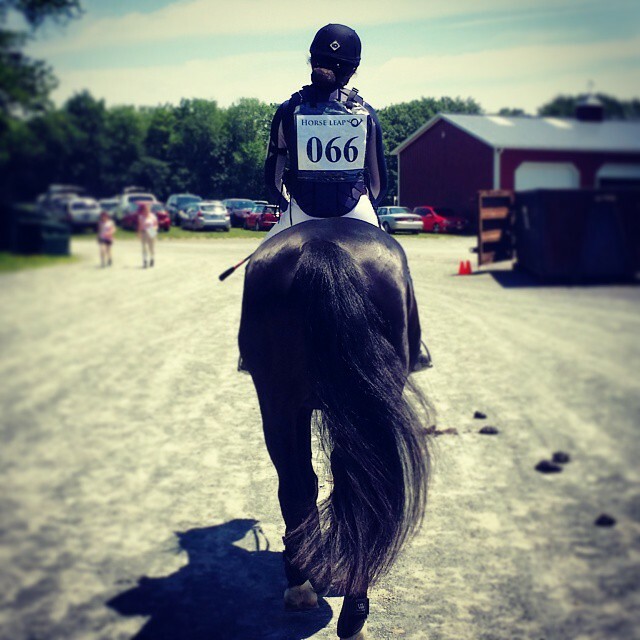 She never once ‘blamed’ the numbering of the jump, but this jump was confusing to several riders, some of which also ended up falling off or getting refusals. Jen’s fall eliminated them from the competition. Jen was tearful and in slight shock (based on the trembling lip and outburst of crying and laughing) but they both recovered with poise and dignity of true sportsmanship. …and I am unbelievably proud.